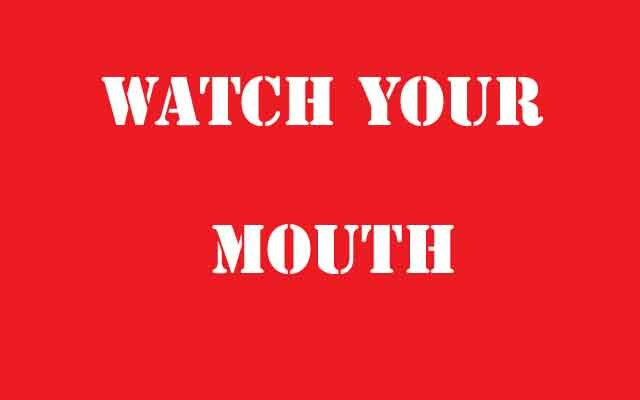 Proverbs & Wisdom » Watch Your Mouth! He who guards his lips, guards his life. Your words are valuable. Even the words you think are unimportant have significance. If you want to become successful you must learn how to utilize your words in a successful way. Meaning, discouraging words, doubtful language, lies, and gossip can hurt your life. When you speak, make sure it is not just nonsense. Speak words of wisdom, words of intelligence, and most of all words that are uplifting to both you and those around you. Speaking with wisdom also demands attention. If your words are few yet wise, people are bound to listen. Have you ever noticed if you hear something too often or if someone is telling you something that isn’t too important you become numb to it? You tune out what they are saying and gradually as they continue talking, your interest declines. However, if your words are filled with knowledge, people will listen. They will be curious and interested in what you have to say because they know your language is meaningful. It is going to affect them positively. Proverbs 15:23 says, “Giving the right answer at the right time makes everyone happy.” If you speak words of wisdom, especially when needed, your words will have a greater value. If you want your life to change you have to change the way you speak. Talking negatively is the same as doing something badly and expecting good results, chances are, it isn’t going to happen. I implore you to read the book of Proverbs if you really want to improve. It’s so beneficial to your life. It even says that if you speak with wisdom and sensibly, you can persuade others (Proverbs 16:23). A good way to study speech in this book is to put a “s” every time you see the words “language, tongue, speak, and words”. My friend, good things are in store for your life, but it is up to you to seize them. Be blessed. My friend, Marie Wikle, has a wonderful printout sheet on the power behind watching our mouth. You can read “The Power of Positive Words” here.